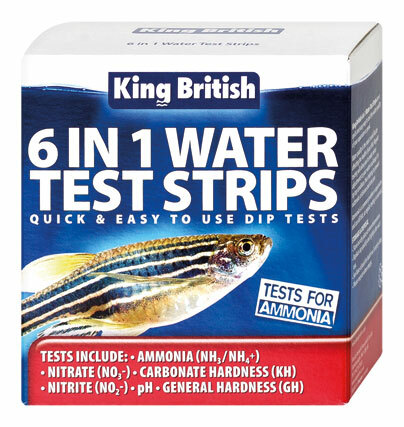 King British 6 in 1 Water Test Strips | Livefood UK Ltd.
Includes tests for levels of Ammonia, Nitrate, Carbonate Hardness, Nitrite, pH & General Hardness. Contains sufficient test strips to check all six parameters every week for 25 weeks, thus aiding you to monitor water quality & keep fish in optimum health. 1. Using a clean container obtain a sample of water from the aquarium or pond for testing. 2. Using dry hands remove test strip from container without touching the test pads. Immediately close cap. 3. Dip the strip into the container of water, ensuring that all the pads are fully immersed. 4a. 5 in 1 strip – immerse for 2 seconds, remove and hold the strip horizontally, test pads facing upwards (do not shake off excess solution). After one minute compare the test pads to the colour chart on the container. 4b. Ammonia strip – immerse for 5 seconds, then remove and hold the strip horizontally, test pads facing upwards (do not shake off excess solution). After one minute compare the test pad to the colour chart on the container. It can be useful to make a note of the results & the date using the table in the enclosed Water Quality Care Guide. If necessary, carry out any actions required to improve the water quality. Advice on how to improve the water quality can be found in the enclosed Water Quality Care Guide. Test strips are very sensitive to moisture, therefore, avoid water contacting unused strips. Replace cap quickly and tightly after each use.